Western blot analysis of extracts from various cell lines using QKI Antibody. 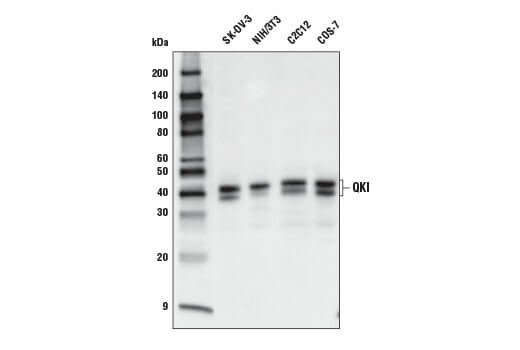 QKI Antibody recognizes endogenous levels of total QKI protein. This antibody detects QKI-5 and other isoforms. Polyclonal antibodies are produced by immunizing animals with a synthetic peptide corresponding to residues surrounding Gly202 of human QKI protein. Antibodies are purified by protein A and peptide affinity chromatography. Quaking (QKI) is a member of the signal transduction and activator of RNA (STAR) protein family of RNA binding proteins (1,2). Mutations in the mouse Qki locus results in impaired myelin formation resulting in tremors (3). QKI proteins exist as homodimers, and disruption of the dimerization process is lethal in mice (2). QKI exists in different isoforms that differ in their C-terminus, resulting in unique subcellular localizations (4). The nuclear isoform of QKI, QKI-5, is involved in regulation of alternative splicing of MAG mRNA, which encodes for a protein important for myelin sheath formation and maintenance (4,5). QKI has also been implicated in schizophrenia and oligodendrocyte differentiation (6). QKI can function as a tumor suppressor, as it is regulated by p53 to stabilize miRNAs that regulate TGF-Β signaling (7). Vernet, C. and Artzt, K. (1997) Trends Genet 13, 479-84. Chen, T. and Richard, S. (1998) Mol Cell Biol 18, 4863-71. SIDMAN, R.L. et al. (1964) Science 144, 309-11. Wu, J. et al. (1999) J Biol Chem 274, 29202-10. Wu, J.I. et al. (2002) Proc Natl Acad Sci U S A 99, 4233-8. Aberg, K. et al. (2006) Proc Natl Acad Sci U S A 103, 7482-7. Chen, A.J. et al. (2012) Genes Dev 26, 1459-72.